After breakfast drive to Phuentsholing and proceed immigration formalities to visit Bhutan and drive to Thimphu on the way visit Places you can see are Kharbandi Gompa (Rinchending), built in 1967 by the Royal Grandmother, the monastery contains paintings on the life of Buddha and statues of Shubdrung Nawang Namgyal and Guru Rinpochey. The view from the monastery garden towards the Phuentsholing and surrounding Indian plains are superb and after visit Kharbandi Gompa drive to Thimphu for night stay. Evening drive past Trashichhoe Dzong, "fortress of the glorious religion". This is the center of government and religion, site of monarch&' throne room and seat of Je Khenpo or Chief Abbot. Built in 1641 by the political and religious unifier of Bhutan, Shabdrung Ngawang Namgyal, it was reconstructed in 1960s in traditional Bhutanese manner, without nails or architectural plans and visit Lord Buddha Statue, The Buddha Dordenma is located amidst the ruins of phodrang, the palace of Sherab Wangchuck, the thirteenth desi Druk, overlooking the southern approach to Thimphu, the capital of Bhutan. On completion, it will one of the largest statues in the world, at a heigh of 169 feet (515.5 meters) , accommodating 100,000 8-inch tall and 25,000 12-inch tall gilded Buddhas respectively in the interior. 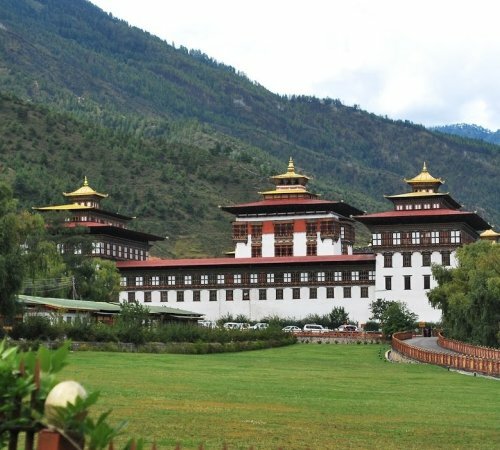 The statue is surrounded by 943 acres of forest area that comprises the kuenselphodrang nature park and you will visit takin zoo and visit Simtokha Dzong, the oldest Dzong in the country that was built in the year 1629, back to hotel night stay in Thimphu. After breakfast drive to Punakha, the road climbs for an hour till you reach Dochula Pass at an altitude of 3150m dotted with colorful prayer flags and 108 Stupa. 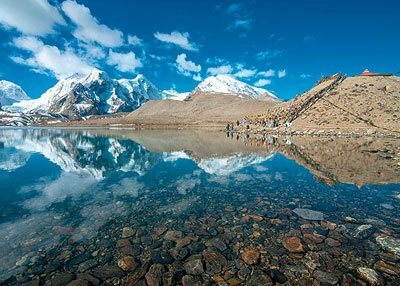 Weather permits, this pass offers the most spectacular view over the high peaks of the Eastern Himalayans. 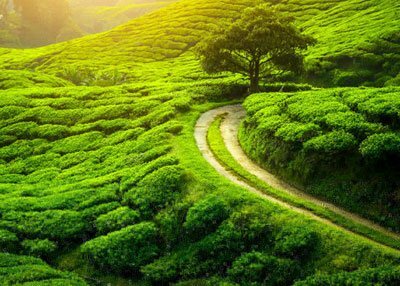 Hike in the nature for an hour on the mountain side and on the way back you can enjoy a hot cup of tea/coffee at the Dochula resort. 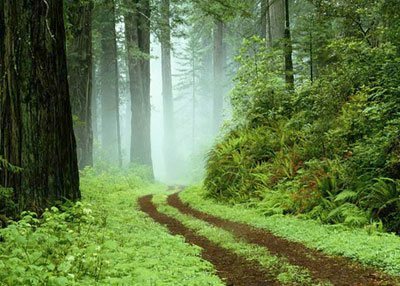 Continue to descend en route to Punakha & Wangdue through the temperate forest of rhododendron & magnolia bloom in spring, then a semi-tropical zone where orange trees, banana trees and cactuses are found in abundance. 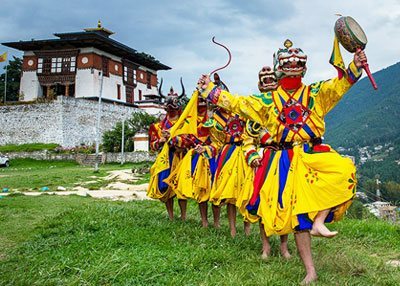 Upon reaching Punakha visit the magnificent Punakha Dzong that was built in 17th century and back to hotel night stay in Paro. After breakfast drive to Paro and check in the hotel and after some rest and visit to Taktsang Monastery. 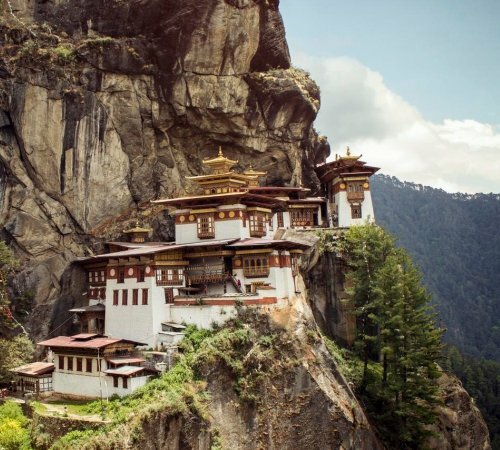 This most famous of Bhutan's monasteries is spectacularly perched on the side of a cliff 900m above the Paro valley floor. Taktsang is a place of pilgrimage which Bhutanese try to visit at least once in a lifetime. It is said that in the 8th century Guru Rinpoche flew on the back of a tigress from eastern Bhutan to this place and meditated in a cave here for 3 months, hence its name, "Tiger's Nest". The site, which has long been recognized as a most sacred place, was visited by Shabdrung Ngawang Namgyal in 1646. The principal lhakhang of the present monastic complex dates from 1692. The main structure was severely damaged by fire in 1998, but after many years of painstaking renovation work, the complex has now been fully restored to its former glory and after that back to Hotel after Lunch drive to visit Kyichu Lhakhang, one of the oldest and most sacred shrines of the country, built in the 7th century by the Tibetan king, Songtsen Gampo.Ta Dzong originally built as Watchtower, which now houses National Museum. The extensive collection includes antique thangkha paintings, textiles, weapons & armour, household objects and a rich assortment of natural and historic artifacts. Then walk down the trail to visit Rinpung Dzong, meaning ("fortress of the heap of jewels"), which has a long and fascinating history. Along the wooden galleries lining the inner courtyard are fine wall paintings illustrating Buddhist lore such as four friends, the old man of long life, the wheel of life, scenes from the life of Milarepa, Mount. Sumeru and other cosmic Mandala. After breakfast drive to Lataguri/Jaldapara for night stay. 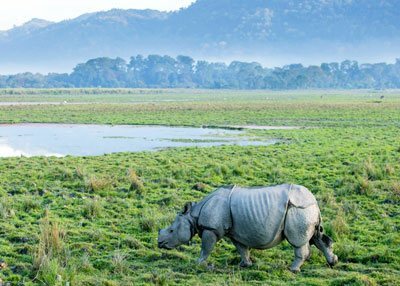 After breakfast drive to Bagdogra airport/NJP from Lataguri/Jaldapara to end your trip.